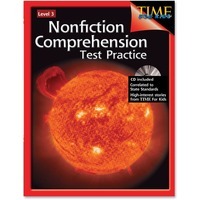 Shell Gr 3 Nonfic Cmprehsn Tst Practice Education PrintedElectronic B SHL10333 $24.09 Inspire lifelong readers with this book as your third grade students practice and prepare for testing with motivating nonfiction text and comprehension exercises. This series is based on articles from TIME For Kids magazine and provides reading comprehension practice in standardized test format. Encourage daily practice of comprehension skills with articles edited for readability and improve students' standardized test scores with quick or in depth activities.